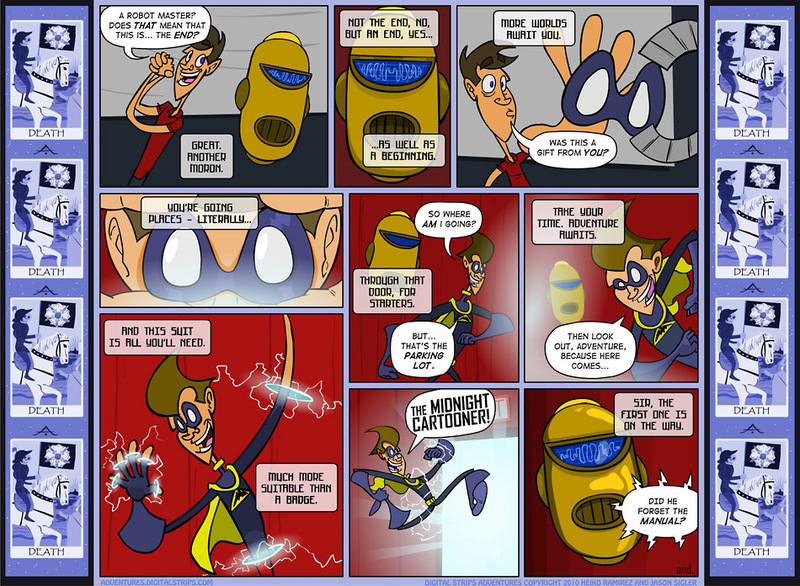 Digital Strips Adventures » Archive » Origins: Midnight, Page 9: An Exit… Or An Entrance? This is the perfect point to say we can lay all of our cards (thus far) on the table. Midnight is now Midnight, having been given his costume by Jerry, who seems to be conspiring with Daku towards some end that is yet unknown (seriously, Heiko hasn’t even told me what the end is yet). The rest of Midnight’s cohorts will have their stories told in future Origins tales, and while I’d love to see us return to the beginnings of Midnight, I’m not sure there’s much more of a story to tell there. For now, I hope you enjoyed the funny faces and zany hijinx that accompanied the birth of The Midnight Cartooner and are preparing for the beginning of our next arc, this time taking place in the mythical world of Finder’s Keepers. This world is a place full of magic and amazing things, but the sharp sense of humor that the characters exhibit is probably my favorite detail about the comic. Hope we can add a little something special to that dynamic with this next arc! Come back next Monday to join in the experiment! Wow. You actually depicted the Death card accurately. Death is merely change, as every change is an ending and a beginning. I would really like to say tahnks very much for your work you have made in writing this article. I am hoping the same effective job by you down the road also.